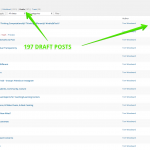 People often activate FeedWordPress but forget to set the feeds to update. I added this little bit to the Motherblog plugin so that on activation of that plugin FWP gets set automatically. Pushing/Pulling Data – Thinking Computationally? Differently? #IndieEdTech? In WordPress multisite there is a set of allowed file extensions that can be found at Settings>Network Settings in the “Upload File Types” field. You can add to this list but what isn’t necessarily apparent is that if the extension isn’t already part of the list hereIt is a generous list. then you can add extensions all day and you’ll still get the security warning. To make a weird extension work . . . like .studio3 for instance you have to add the extension there and do a bit more. I tossed the following code in our network activated custom Rampages plugin. It’s just a hodgepodge of bits of code like this that I want applied across the site but that doesn’t seem like it deserves a plugin of its own. Take note that if you try to guess at the mime type and get it wrong, things won’t work. You’ll be able to select the file in the media uploader but it’ll still give you the security warning. I found this site for determining mime types. There may be other ways but it worked. Towards the end of the day I was asked for an easy way for students and others to do “properly-formatted (hanging indent) citations.” As I use URLs for citation I had never thought of this. A little googling and it seems to be a common issue for people and I eventually hit this old vintageYouTube defines vintage as anything over a year old. video from Clint Lalonde (who I recognized immediately from his Twitter avatar). After seeing one jerk’s comment I felt a great need to make something even sort-of-good come from Clint’s effort to share something good with the world. Behold. The simplest possible WordPress shortcode plugin (SPWPSP – if you’re playing at home). And while it’s no SPLOT, it is very, very simple and it gives you the magical hanging indent. Just write [hangit]”None to Claim Their Bones: Relics of an Old Brooklyn Graveyard.” New York Times 8 Apr. 1888: 3-4. ProQuest Newspapers. Web. 10 June 2006. [/hangit] and you’ll get a nice hanging indent. I did have to change the shortcode to an enclosing shortcode (one that opens and close- like an HTML tag) to deal with quotes and apostrophes that are likely to show up in the citations. This is all it takes. Get it on Github here.